Clean the air in your home with our portable Air Purifier designed specifically for Hawaii Vog, allergens, dirt, germs & more! Sulfur dioxide (vog), VOC, HEPA, trap dust, dander, pollen and other airborne particles..gone! 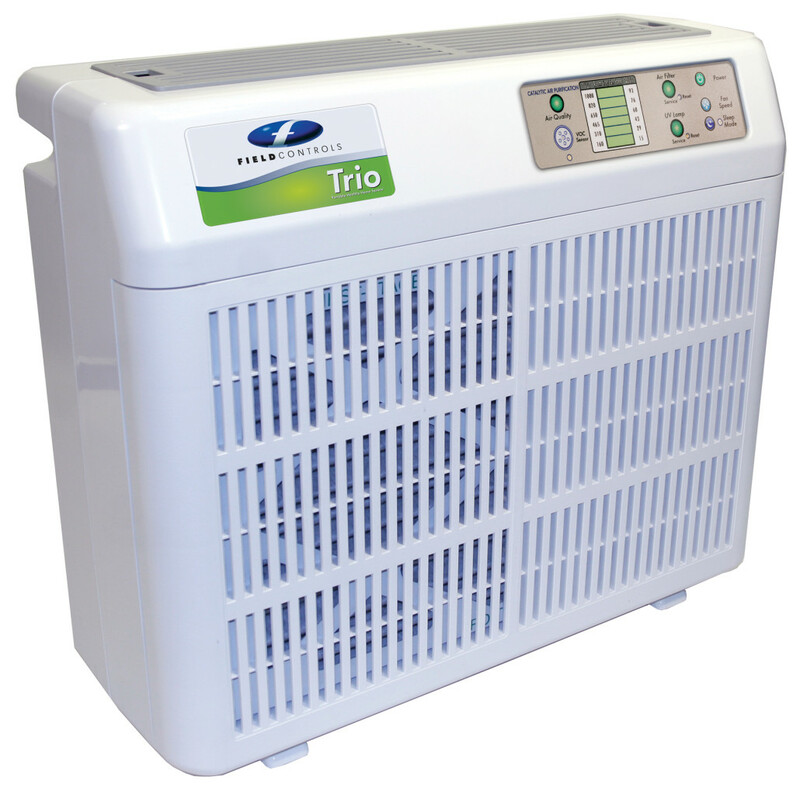 The Trio Portable Air Purifier is ideal for Hawaii homes and offices and will clean the air, even on heavy VOG days. Vog is a term that refers to volcanic smog. It is the haze you may see in the air that is caused by a combination of weather, wind conditions and volcanic activity. Vog becomes thicker or lighter depending upon the amount of emissions from Kilauea volcano, the direction and amount of wind, and other weather conditions. Is vog harmful to my health? People with pre-existing respiratory conditions (such as asthma or emphysema) are more likely to experience health effects from vog which may include: headaches, breathing difficulties, increased susceptibility to respiratory ailments, watery eyes, and sore throat. The long-term health effects of vog are unknown although some studies are under way at the University of Hawai‘i. See our Hawaii Air Quality Map below to see the current state of air quality in Oahu, Kauai, Maui and Hawaii Island. Data courtesy of Hawaii Department of Health – Environmental Health. but when the Vog Days come, its another story. This portable air purifier is designed to completely clean VOG down to the last molecule. How does it do it? It has a miniature “catalytic converter”, similar to the one in a car that rips apart the VOG at the molecular level. Click here to see diagram on how the catalytic converter works. Before the air can even get to the catalytic converter, it first has to pass through 4 stages of filtration including hospital grade HEPA filtration. 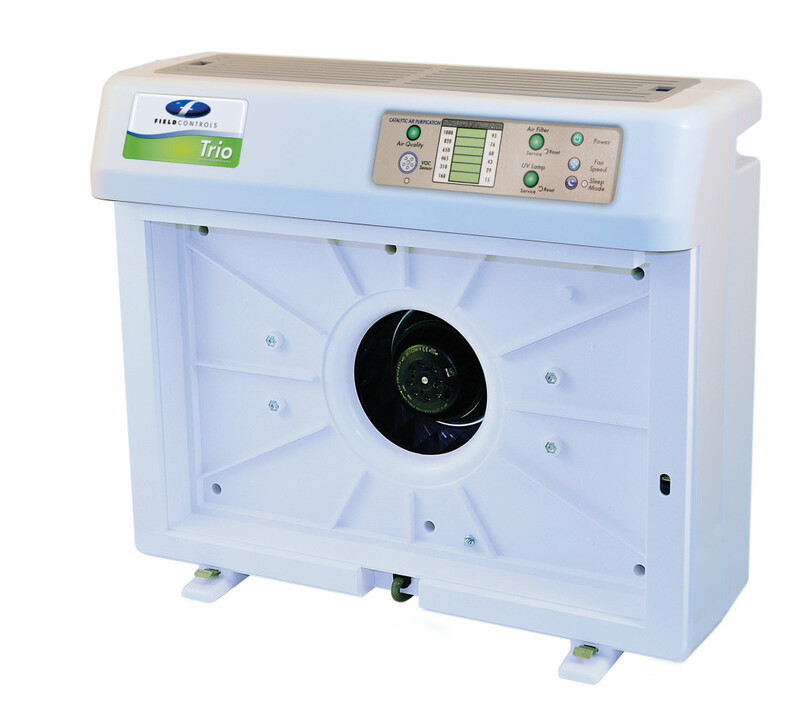 ​Trio Portable has a ​built-in germicidal UV lamp that kills mold spores, bacteria and airborne flu virus. Another added benefit is the removal of VOC gasses (typically the contaminants causing foul odors in your home) Pet odors, Damp/Mildew “dirty sock syndrome”, cooking odors, etc. Pro-Cell and UV take out what mechanical filtration cannot –Not to mention the pollen and airborne particulates that comes with landscape and plant life. The Trio is portable so you can move it around the house. 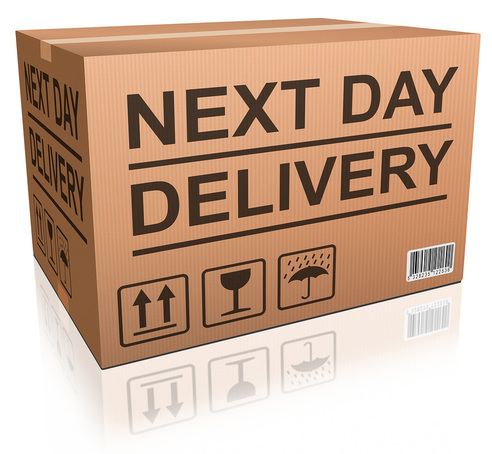 Keep one in the bedroom at night, and move it to the living room during the day. 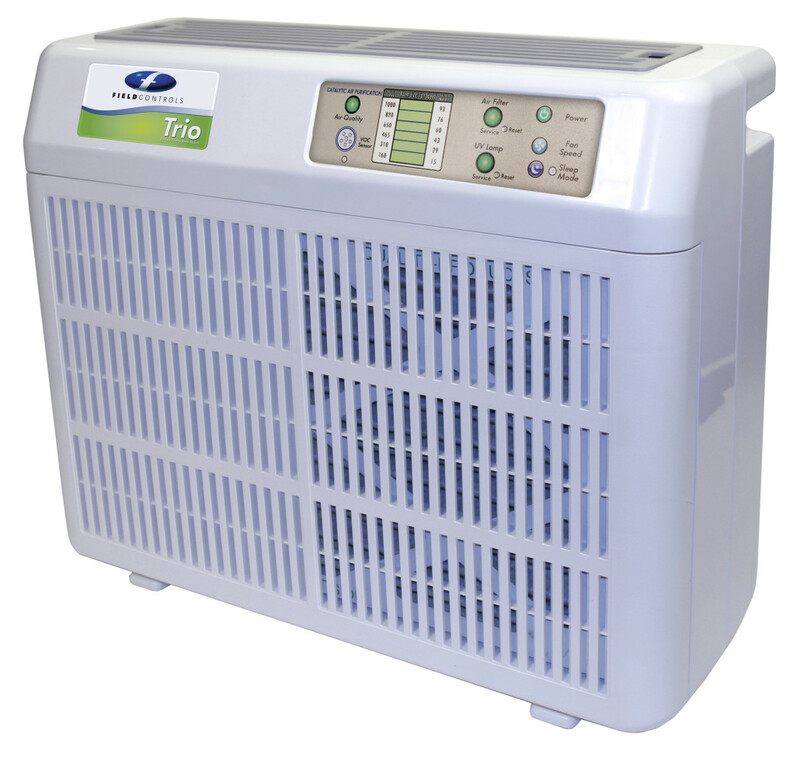 Trio Portable is made in the USA, has a five year warranty and 30 day money back guarantee ​(from Island Cooling LLC). Trio Portable can clean an area of over 1000+ square feet, but it is proximity based. Move it to different areas of the home to target those areas, or ​add a second unit. The Service Panel Indicator Lights: (“Air Filter” and “UV Lamp”) on the Service Panel tell you if either the air filters or the germicidal ultraviolet lamp will soon need to be cleaned or replaced. Air Filter Indicator Light: Depending on usage the filters have a useful life of one continuous year in a typical residential environment. Actual replacement schedule will vary depending on usage and environmental factors. Red LED Air Filter light is On: The filter has been in service for at least 4500 hours. 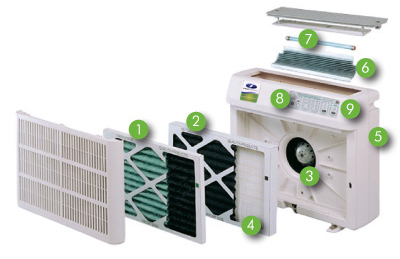 It is time to remove the front grill and vacuum off the top pre-filter to maintain maximum air flow. The filter does not need to be removed. Replace the front grill and press only the filter reset button to reset timer for 6 more months. Ultraviolet Lamp Indicator Light: The UVC Germicidal Ultraviolet Lamp has a useful life of one continuous year (9,000 hours). Actual replacement schedule will vary depending on usage and environmental factors. Red LED UV Lamp light is On: The lamp has been in service for more than 12 months. 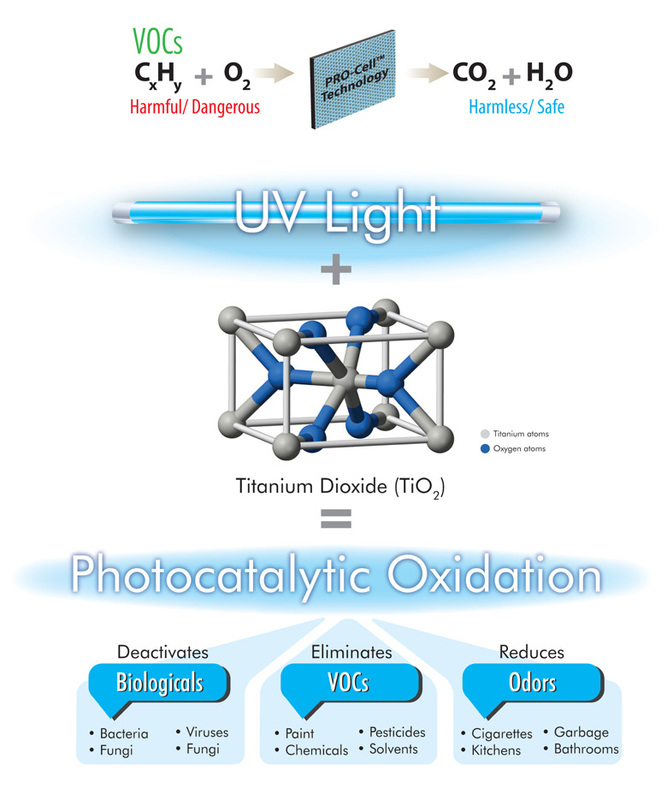 The UVC Germicidal Ultraviolet Lamp may not be effective and must be replaced. 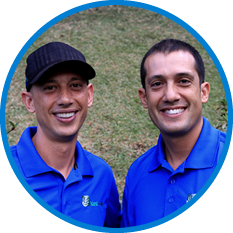 Brothers Al and Ivan Whitworth started Island Cooling in 2008 after discovering the energy efficient whole house fan and how well it performed in Hawaii’s climate. As they answered the need for cool natural air, they discovered a need for pure clean air, especially on VOG days. –This sent Al on a quest to discover the best air purification product for Hawaii’s climate and thus Air Purifiers Hawaii is born.